Equipment (to 21 SEP 2019): satellite TV; internet access Wi-Fi (included); washing machine; oil central heating. Equipment (from 21 SEP 2019): satellite TV; internet access Wi-Fi (included); washing machine; oil central heating; ski storage facility in the house (ski boot dryer). Please note: Non-smoking house. detached house, 36 people, 19 room/s, 16 bedroom/s, 11 bathroom/s, approx. 350 m², 3 floor/s, access to the property via external stairs. Bedroom 1: (raised ground floor): single bed. Additional information: wash basin in the bedroom. Bedroom 10: (floor 1): double bed, exit to balcony. Additional information: direct access to sanitary no 7. Bedroom 11: (floor 1): double bed, exit to balcony. Additional information: direct access to sanitary no 8. Bedroom 12: (floor 1): double bed, single bed. Additional information: direct access to sanitary no 9. Bedroom 13: (floor 2): 2 x single bed. Additional information: wash basin in the bedroom. Bedroom 14: (floor 2): 3 x single bed, exit to balcony. Additional information: wash basin in the bedroom. Bedroom 15: (floor 2): 3 x single bed, exit to balcony. Additional information: wash basin in the bedroom. Bedroom 16: (floor 2): 3 x single bed. Additional information: wash basin in the bedroom. Bedroom 2: (raised ground floor): double bed, exit to balcony. Additional information: direct access to sanitary no 1. Bedroom 3: (raised ground floor): double bed, single bed, exit to balcony. Additional information: direct access to sanitary no 2. Bedroom 4: (raised ground floor): double bed, single bed, exit to balcony. Additional information: shower in the bedroom. Bedroom 5: (floor 1): single bed. Additional information: wash basin in the bedroom. Bedroom 6: (floor 1): single bed. Additional information: wash basin in the bedroom. Bedroom 7: (floor 1): double bed. Additional information: wash basin in the bedroom. Bedroom 8: (floor 1): double bed. Additional information: wash basin in the bedroom. Bedroom 9: (floor 1): double bed, single bed, exit to balcony. Additional information: wash basin in the bedroom. Kitchen: Kitchen/ cooking equipment: 4 ceramic hobs, 1 induction fields, oven, dish-washer, refrigerator, freezer, coffee machine, water boiler, toaster. separate (raised ground floor). Living room/lounge: (raised ground floor): tables, chairs. Living room/lounge 2: (raised ground floor): tables, chairs. Sanitary 1: (raised ground floor, access from one bedroom only): shower, WC. Sanitary 10: (floor 1): shower. Sanitary 11: (floor 1): separate WC. Sanitary 12: (floor 1): separate WC. Sanitary 13: (floor 2): shower. Sanitary 14: (floor 2): separate WC. Sanitary 15: (floor 2): shower. Sanitary 16: (floor 2): separate WC. Sanitary 2: (raised ground floor, access from one bedroom only): shower, WC. Sanitary 3: (raised ground floor, access from one bedroom only): shower. Sanitary 4: (raised ground floor): shower, WC. Sanitary 5: (raised ground floor): separate WC. Sanitary 6: (raised ground floor): shower. Sanitary 7: (floor 1, access from one bedroom only): shower, WC. Sanitary 8: (floor 1, access from one bedroom only): shower, WC. Sanitary 9: (floor 1, access from one bedroom only): shower, WC. Access/parking: 12 x parking on the estate. Important information: Music and parties are not allowed on this property. Four accommodation units with separate access are in private use. Outdoor facilities: (private use): balcony. Arrival: Airport Innsbruck in approx. 70 km. 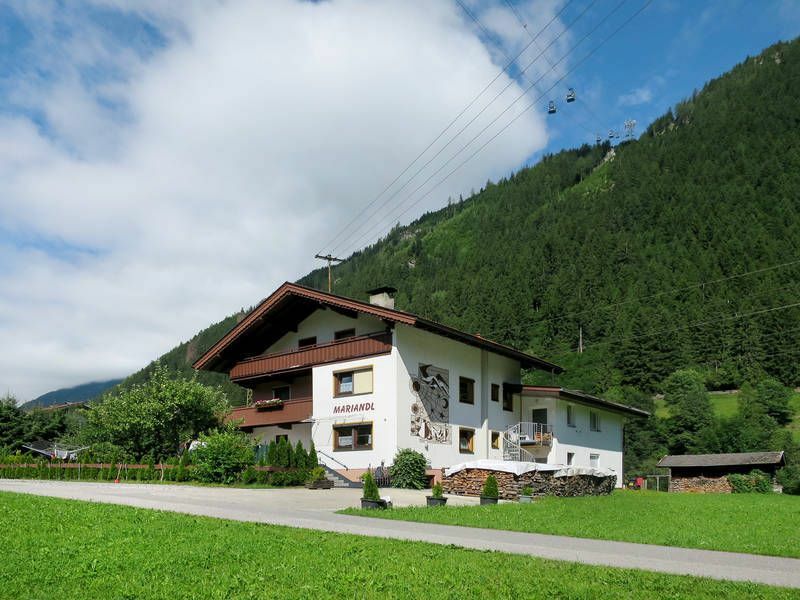 Arrival (from 21 SEP 2019): Train station Mayrhofen in approx. 750 m.
Cable car: Penkenbahn, in approx. 400 m.
Next village/town: Center Mayrhofen in approx. 400 m. Hippach in approx. 5 km. Shopping: Next supermarket in approx. 250 m.
Ski run (from 21 SEP 2019): Ahornbahn in approx. 400 m. Penkenbahn in approx. 400 m.